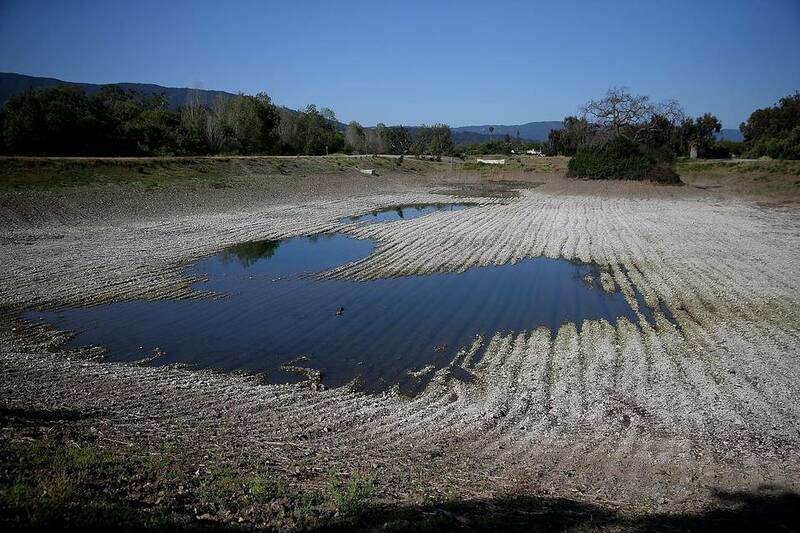 California’s Green DroughtHow bad policies are compounding the state’s water shortage. Low water levels are visible at the Los Capitancillos Recharge Ponds in San Jose, California on April 3, 2015. The liberals who run California have long purported that their green policies are a free (organic) lunch, but the bills are coming due. Lo, Governor Jerry Brown has mandated a 25% statewide reduction in water use. Consider this rationing a surcharge for decades of environmental excess. Weather is of course the chief source of California’s water woes. This is the fourth year of below-average precipitation, and January and March were the driest in over a century. The Sierra Nevada snowpack, which contains about a third of state water reserves, is 5% of the historical average compared to 25% last year. Reservoirs and aquifers are also low, and some could run dry this year. While droughts occur intermittently across the globe, other societies have learned better how to cope with water shortages. For instance, Israel (60% desert) has built massive desalination plants powered by cheap natural gas that helped the country weather the driest winter on record in 2014 and a seven-year drought between 2004 and 2010. Then there’s California, which has suffered four droughts in the last five decades with each seemingly more severe in its impact. Yet this is due more to resource misallocation than harsher conditions. During normal years, the state should replenish reservoirs. However, environmental regulations require that about 4.4 million acre-feet of water—enough to sustain 4.4 million families and irrigate one million acres of farmland—be diverted to ecological purposes. Even in dry years, hundreds of thousands of acre feet of runoff are flushed into San Francisco Bay to protect fish in the Sacramento-San Joaquin River Delta. Increased surface storage would give regulators more latitude to conserve water during heavy storm-flows and would have allowed the state to stockpile larger reserves during the 15 years that preceded the last drought. Yet no major water infrastructure project has been completed in California since the 1960s. Money is not the obstacle. Since 2000 voters have approved five bonds authorizing $22 billion in spending for water improvements. Environmental projects have been the biggest winners. In 2008 the legislature established a “Strategic Growth Council” to steer some bond proceeds to affordable housing and “sustainable land use” (e.g., reduced carbon emissions and suburban sprawl). Meantime, green groups won’t allow new storage regardless—and perhaps because—of the benefits. California’s Department of Water Resources calculates that the proposed Sites Reservoir, which has been in the planning stages since the 1980s, could provide enough additional water during droughts to sustain seven million Californians for a year. Given the regulatory climate, Gov. Brown’s bullet train will probably be built first. Once beloved by greens, desalination has likewise become unfashionable. After six years of permitting and litigation, the company Poseidon this year will finally complete a $1 billion desalination facility that will augment San Diego County’s water supply by 7%. Most other desalination projects have been abandoned. One problem is that California electricity rates are among the highest nationwide due to its renewable-energy mandate, and desalination consumes amp-loads of energy. Local and state regulators also impose expensive environmental requirements. Poseidon had to restore 66 acres of wetlands in return for its desalination permit. The only remaining alternative to stretch scant water supplies is conservation. Yet studies show that mandates and subsidies for low-flow appliances like California’s don’t work because people respond by changing their behavior (e.g., taking longer showers). Despite the diminishing returns, Mr. Brown has ordered more spending on water efficiency. The most proven strategy to reduce water consumption is market pricing with water rates increasing based on household use. Many water suppliers, and much of Southern California, adopted water metering and market pricing decades ago. But since state law doesn’t mandate metering until 2025, some areas have been slow to shift from fixed rates. Other suppliers haven’t been as aggressive as they should be at charging for extra water use, which has contributed to large disparities in consumption. For instance, the per-capita daily water use in Cowan Heights is 281 gallons versus 170 in neighboring east Orange and 101 in Tustin. To his credit, the Governor has instructed the State Water Resources Control Board to develop pricing mechanisms to meet the state’s 25% benchmark and to require larger reductions from suppliers whose residents use more water. His order exempts farmers, yet their water has already been curtailed. Even in wet years, farmers have only received 45% of their contractual allocations due to wildlife diversions. Over 500,000 acres of land were left fallow last year. Many are now drilling deeper wells to pump groundwater at increasing marginal costs. Not even Gov. Brown can make it rain, but he and other politicians can stop compounding the damage by putting water storage, transportation and market pricing above environmental obsessions. Do not hold your breath—and prepare for French showers.